Today we arrived at Anjajavy on Madagascar’s northwest coast. It’s a remote area of dry deciduous forest and mangroves, accessible from other parts of the island only by sea and air. 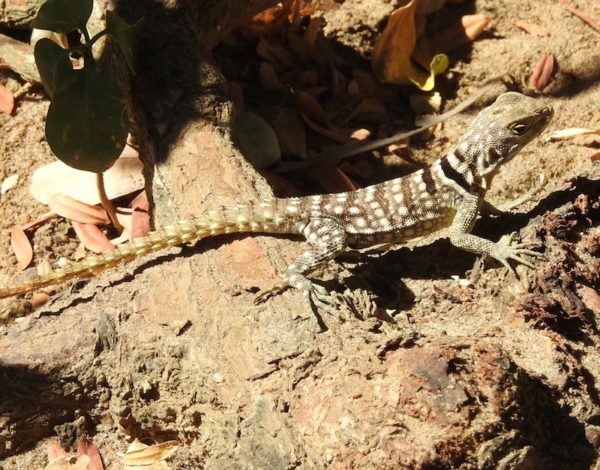 Within fifteen minutes of disembarking, we were greeted by not one, but two awesome reptiles: a pink Oustalet’s chameleon—pink because it was hiding out in a begonia bush, so its skin took on the tone of the flowers—and the creature above: the collared lizard (Oplurus cuvieri). If you look closely at the top of this lizard’s head, you may notice a brown spot at the center, much like the one on the three-eyed lizard from the other day. Perhaps you suspect it’s a cluster of photoreceptors. You’re right! Both reptiles belong to the same evolutionary family of reptiles, the Opluridae, and they both have this “third”, or parietal, eye.